RAGE’s release date is looming ever closer and at GamesCom we were given a lengthy hands-on with the game. Having been in development for over 4 years we had worries that the title might not feel as fresh and original as it initially seemed. So, were our fears justified and does RAGE stand up as another classic id Software first-person shooter? After seeing previous versions of the game we were concerned it might feel very similar to titles such as Borderlands and Fallout 3. To some extent that still seems true and there are a lot of elements that are distinctly familiar from these titles. However, the story and visuals are distinct and after spending time in the ravaged, post-apocalyptic world, so is the gameplay. RAGE begins with the events that led up to the annihilation of much of the human population after a catastrophic meteorite impact in 2029. Before the collision the world’s governments created the “Eden Project”, in order to preserve humanity by burying pods of specialists deep underground that were known as Arks. Your character awakens some time after the devastation to a completely changed environment: one that is now largely desert, is littered with struggling populations and hordes of vicious bandits. The opening sequence was very well handled and coming around in a dark, claustrophobic pod was both atmospheric and memorable. As the chamber began to unseal and the tension and build up increased, we were met with a real disappointment. Playing the game on Xbox 360, to see how to the consoles could handle the id Tech 5 engine, the big opening moment was a letdown. As the Ark’s door opened we were met with an apocalyptic landscape, similar to the exit from Vault 101 in Fallout 3. However, the draw distance and textures were disappointing and the distant objects, such as a huge dam just appeared as a grey splodge. It was even more noticeable given how good some of the graphics were elsewhere in the game and amounted to a lacklustre sequence. These issues suggest that the new engine might not necessarily be suited to consoles and elsewhere in the early missions we faced similar rendering issues that undermined the otherwise excellent visuals. It was a real shame that so early on such an obvious issue was presented and it really undermined an otherwise strong opening. Thankfully, there were very few other problems with RAGE and once outside into the game world we became lost in the story and combat. It’s worth noting that the music was really excellent and felt like a combination of classical Western music and some more modern influences. There were moments when the guitar riffs brought to mind the Firefly soundtrack and that was certainly no bad thing. After exciting the vault, you bump into a friendly local named Dan Hagar, who drives you to his own settlement and asks a favour. Your first quest in game is to clear out a bandit encampment with Hagar providing you with a simple pistol and a quad bike. It’s a brief introduction and RAGE wastes no time in getting you stuck into the combat. Using the handy mini-map in the top corner of the screen, it’s very easy to find your way around the game world and reaching the bandit’s den was straightforward. 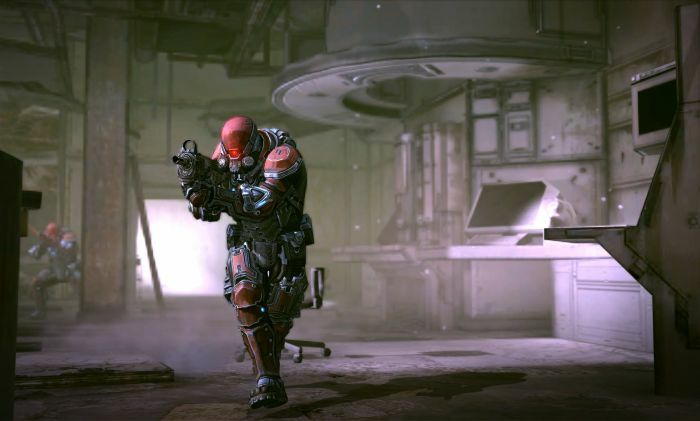 Here RAGE really felt like an id Software shooter and the gunplay was smooth, intense and enjoyable. The weapons were typically meaty and satisfying and the enemy AI was particularly impressive. The bandits took cover, attempted to flank you and worked together. 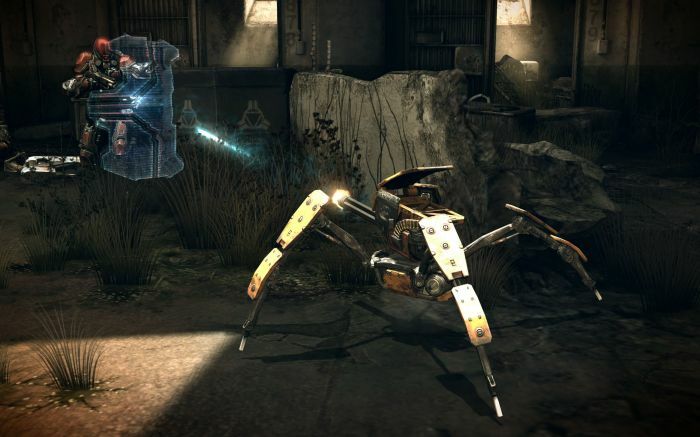 It was easily some of the most impressive and challenging AI that we have seen in some time and playing the game on the hardest difficulty, Nightmare, must be a very tough undertaking. The pistol has different ammunition types, such as Fatboy Slugs that inflict more damage. This tactical choice, which seems to have been inspired by Bioshock was a nice touch and helped add more depth to the shooting. While working your way through the lair, it was possible to scavenge junk, ammunition and items. Most of these are useless and can be sold for cash at vendors when you return to settlements but it seems that others can be used to craft items. It’s a move which was heavily reminiscent of Fallout 3 but we never got a chance to really experiment with combinations or to inventory management. Moving between areas triggers a load time but even on the console these were very quick and rarely broke up the action substantially. Heading back to Hagar we were then free to pick up side quests and explore. Using some of the dollars and items we had looted from the bandits, we bought an assault rifle and some Wingsticks. These boomerangs are particularly useful stealth weapons, can be recovered from corpses and kill most standard enemies in a single hit. After speaking with Dan, we went to a nearby settlement run by the Outriggers, a group of engineers who also had a lot of medical supplies. Before they would part with some of their spare health kits to help Hagar and his community, they wanted us to run several errands for them. These included locating a missing person, repairing their radio tower and finding some spare parts for their work. It felt like the rigmarole of early RPG games where you have to learn the mechanics in order to level up and involved a lot of fetching back and forth. Here the game did feel a little monotonous as it involved driving to a set location, climbing out of the vehicle and then fighting through a classic id Software corridor shooter segment. 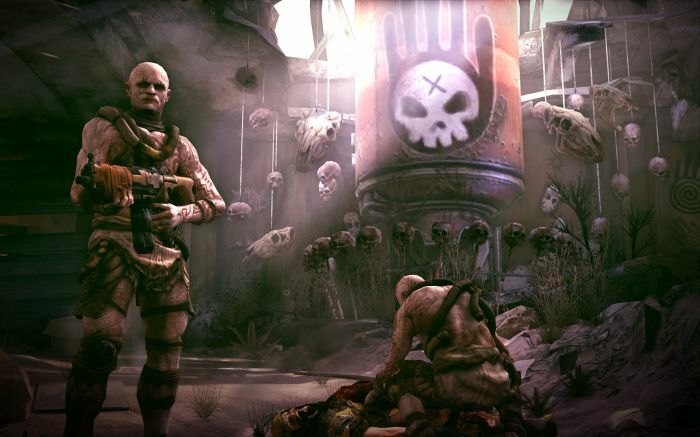 While RAGE has been described as a sandbox game, that didn’t entirely feel accurate. It may be possible to explore and choose which quests to do, once you arrive at a location it’s a typical linear shooter. This isn’t necessarily a criticism as the gunplay is so satisfying: it is both tactical and exhilarating. Throughout these numerous side quests, we earned new weapons and items and there was a definite sense of progression. While these early quests were perhaps a little too simplistic and new game mechanics were spoon-fed to the player, it was never dull. The shotgun earned during an early Outrigger mission was particularly awesome and eliminated most bandits and mutants with a single devastating blast. Some clever level design also meant that you rarely have to backtrack through cleared locations. Once you’ve fought through a level or area, there is usually a handy zip line to return you to the beginning, which is a really nice touch that avoids frustration. 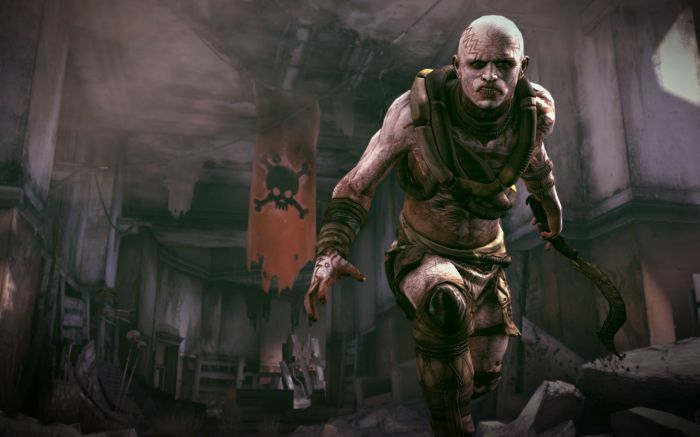 While RAGE does feel familiar in some ways, it’s the way that these gameplay elements are fused together that is different. The developers have really nailed the gunplay and shooting mechanics and it’s never been more satisfying than to shoot a flanking, pipe-wielding psychopath in the head with a few assault rifle rounds. The switch between driving and action was never difficult to grasp and even the vehicle handling was robust and easy to adjust to. It’s clear that the id Software team are veteran developers who know their primary genre. It is also clear that they have successfully fused classic first-person action with other ideas and RAGE was definitely an enjoyable experience. Aside from the graphical issues on the Xbox 360, we encountered very little that really disappointed. The real test for RAGE now is whether it can provide a varied and enjoyable campaign for the full length and keep the player hooked on its setting and plot. We could quite happily continue to play for another few hours and we were definitely sad when our hands-on time came to an end. That’s certainly a recommendation and we will definitely be looking forward to blasting some mutants when the game launches on October 7th.